Coming back from Thailand, I was craving for food in the Teacher’s Village area. Yesterday, the whole area was rather quiet so we had a pick on which restaurant we will be dining at. We eventually chose Fruili Trattoria. It is rather unassuming restaurant beside Krazy Katsu. We were seated on the 2nd floor which had approximately 10 tables on it. A steep swirling stair case goes up to the 2nd floor, quite a fire hazard issue if you ask me. 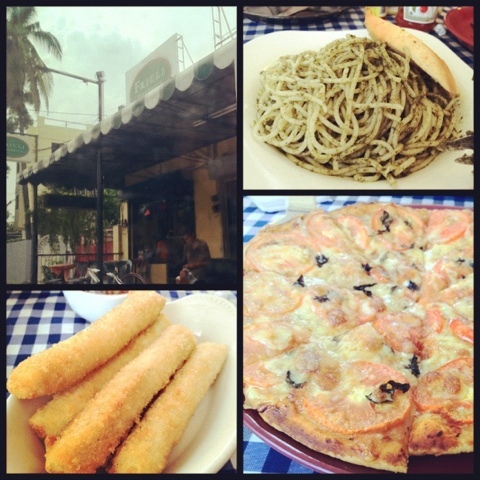 Anyhow, as we were given the menu, we decided to share a Margherita pizza, mozzarella sticks and a pesto pasta. The Margherita pizza wasn’t bad with huge tomatoes and lots of cheese on top. Crust was thin and crunchy. For Php185.00, it was big enough to be shared with 3 of us. The pesto pasta was nothing special. I loved the mozzarella sticks. The dip it came with was slightly spicy with the right kick.